“Wow! Wow! Wow! Where is everybody getting guns? This is Canada!” cries out the main hero of the new Canadian comedy “No Clue”, opening in theatres across Canada this weekend. Well, the guns, I’m not sure where they are coming from, but the watch on his wrist is from Hamilton. 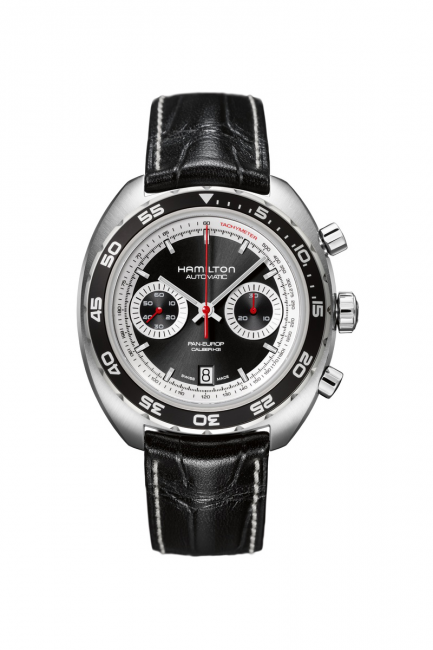 It is actually a Pan Europ automatic chronograph which is inspired by a Hamilton timepiece of the same name, originally introduced in 1971 (the same year the brand joined the Swatch Group – then known as SSIH). Although the design of today’s model takes a nostalgic look over its shoulder, its functionality is thoroughly modern. A slightly squared case, elegant black dial and bezel backgrounds, make the Hamilton Pan Europ stand out from any crowd. Two chronograph counters stare out of the dial like knowledgeable eyes and the fine markings of the tachymeter confirm the watch’s intrinsic timekeeping competence. Placed neatly at 6 o’clock, the date display completes the symmetrical picture. The robust 45 mm stainless steel case represents an unmistakably contemporary touch, with its ridged crown and two pushers adding a signature of craftsmanship. The strap is in fine black leather with a crocodile pattern, enabling the theme of sophistication to embrace both appearance and operation. Powering today’s Hamilton Pan Europ is a technologically advanced, Swiss automatic chronograph movement, H31. Movie lovers will relate easily to the comparison of the recent evolution of mechanical watches with the 1936 Charlie Chaplin classic Modern Times, where the iconic tramp figure strives to survive in the industrialized world. The Hamilton Pan Europ simultaneously celebrates the pre-quartz peak of mechanical watches in the 1970s and their huge popularity today. In this timepiece, Hamilton takes pride in its deep American roots and in its far-reaching European present and future, whatever changes the times may bring. Here at WatchPaper we definitely welcome Hamilton’s involvement in the Canadian film industry we’re looking forward to see more of its American spirit and Swiss precision in our flicks.